After the heartbreak of losing my rescued baby galah Trooper to terminal liver disease from mycotoxins/alflatoxins (as a result of poor diet from his breeders). 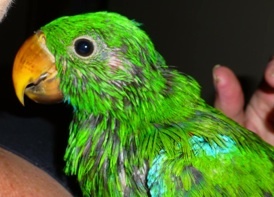 I longed for another bird but knew in my heart that I could not have another galah so I researched Eclectus Parrots and felt I was experienced enough to own one. I put out the word locally for a breeder that I was seeking a fully weaned baby boy about 3-4 months of age knowing how challenging Eckies can be to wean. After all I went through with Trooper I felt emotionally it would be less stressful and I would be able to relax and enjoy my new baby when the time came. I was not to know the extent of stress I was about to be put under. them I was seeking a 3-4 month old fully weaned male. They put me on a list and the waiting began saying I would have a baby by Christmas. I got the call in November saying ‘we have a baby for you’, I was not prepared at all financially and not organised to bring a new baby home as I had packed away all of Troopers things including his cage. But the desire for a baby was strong so I drove up to see this baby and was taken a back by how he looked. He was sitting in a weaning cage placed on a bench in the kitchen right near where food was being cooked and he looked so miserable. They handed him to me and immediately I began to itch, he was covered in lice and mites and I asked him ‘did you want me to be your new mummy?’ he looked at me and cried. The breeders wife said for me to watch how she feeds him as he is still on one sooky feed and was eating fresh foods on his own. I watched closely she shoveled the food into this baby, he had no food response at all and I was curious as to why. She then told me this is how to feed them as they are lazy and that she put oats in the formula as that is what they do to wean and when I asked about his age she told me 10 weeks, her husband confusingly thought 12 weeks and I was thinking oh dear this is not what I asked for and should I just leave. Unfortunately I had already signed the paper work for this baby and handed over the money so it was too late to back out of this deal. 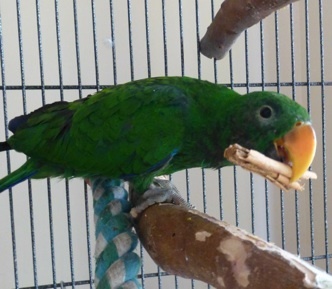 I brought this little skinny baby home, he was not the shade of green I thought he should be, he had half his body covered in blackened feathers and stress bars and he was so skinny and sad looking. I then felt sick thinking have I got another Trooper on my hands, facing the reality I might be raising another sick bird and could lose him. So I put out a call for help on facebook for the people who helped me with Trooper and knowing they were far more knowledgeable than I was. I had a trio of awesome people to help and support me with this baby. It was the defining moment I realised I had made a bad decision in purchasing this baby from these breeders, even thought I armed myself with information and was clear in telling them what I wanted, it did not turn out the way I had hoped. I called my avian vet for advice and he was not impressed with how this situation happened asking if I would send the baby back to be fully weaned, when I explained the sad state this bird was in and the methods used buy the breeders, we came to a decision he was most likely better off in my care. 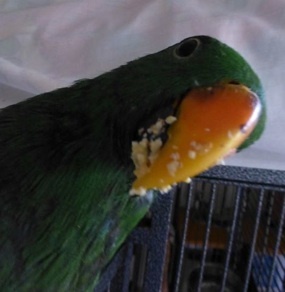 This new baby did not know how to eat, I knew eckies did not have a strong feed response like other parrots but had no idea that it could be non existent. No wonder the breeders said he was a quiet little fellow, he was starving and most likely in shut down. I had to force feed this baby if he had any chance of improving his health. It took quite a while before he showed a response to feeds and for a moment there it almost came to considering using a crop needle to get food into him, but once he clicked onto what I was doing for him, his appetite greatly improved. I decided to put him back on three to four feeds per day in order to build him up and work towards abundance weaning once his health improved. It has taken 5 months of hard work, stress and many tears to get my boy weaned and eating healthy. He is now a 7 month old cheeky boy living up to his name Loki, the norse god of mischief and trickery and is now learning to talk. Loki is still skinny but his weight is still on the lower side of what would be considered normal, he is developing well and is a cheeky happy baby. I strongly believe Loki would have died in the hands of an inexperienced owner. If not for all the heartache I went through with Trooper I would have not been prepared for the situation I found myself in with Loki and for that I thank Trooper with all that I am for coming into my life even if only for a short time. The lessons Trooper and I shared has made me a better bird owner and I happily share this information with other bird owners so that they understand the importance of a healthy diet and the serious risks of illness from poor diet. I am not angry at the breeders, they love their birds. They are retired and not in it for the money, yet are breeding eclectus parrots like other parrot species and from what I have learned that is so not the way to do it. They are from the old school aviculture ways and are not up to date on the techniques of raising this species. By sharing my story I hope that I can help a new owner make an informed decision when buying a baby bird and hopefully no other person has to suffer the immense stress of raising an unweaned bird and in turn it might prevent the unnecessary death of so many baby and juvenile birds as a result of being forced weaned or sold unweaned.